The annual open days organised by Claas main dealer Rickerby Ltd are always popular, and attendance at this year’s two-day event broke all previous records. David Williams was there. Trading since 1880, the dealer has expanded to serve farmers across the north of England into south Scotland, from its eight branches; Carlisle and Penrith in Cumbria, Alnwick, Hexham and Cornhill-on-Tweed in Northumberland, Bowburn in Co Durham, and Carnforth in Lancashire, as well as Castle Douglas and Dunbar in Scotland. The dealer has a total workforce of 130, approximately 80 of which are involved in after-sales and, as well as Claas, represents key machinery franchises including Lemken, KRM, Kramer, Opico, Bunning, Bailey, McConnel, Abbey, Quicke, Kawasaki, Bargam, Tanco and Ransomes together with a wide range of equipment and sundry suppliers such as Kramp, IAE, Tama and BPI. The open days take place each March at the main Carlisle branch and customers attend from throughout the region served by the dealer, many brought in on coaches provided by their local branches. Official start time is mid-day and the days are scheduled to finish at 10pm, the busiest times being early evening when afternoon milking has been completed. Attendance on the first day, Wednesday, this year was 2,900 with a further 2,000 visitors on the Thursday, making the 2015 event the most popular in the Spring Show’s 14-year history. Sales director Martyn Henderson explained that the open days provide a relaxed environment for potential and existing customers to chat with dealer staff and to find out about the products and services available. “People seem to enjoy doing business at the show. The event allows them to negotiate a deal with our staff and there is a wide range of machines available to see. 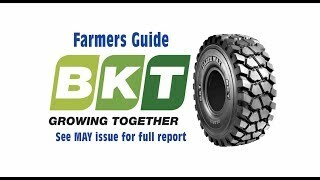 This year the latest Claas tractors were creating considerable interest across the full range and we found that farmers and contractors were continuing to plan for the year ahead, although obviously the current market situation means many are being cautious. It is a challenging industry but still machinery needs to be updated and changed and our staff enjoy helping customers find workable solutions. “We were very busy over the two days, and this year saw high demand for many smaller items. We have always believed it is just as important to look after the smaller farms and businesses as the large-scale farms and contractors and we ensure the open days include products for all farm sizes and types,” he said. Claas is the main franchise and the dealer is celebrating a record year for forage harvester sales. “We are delighted with the Claas range we have available to offer our customers,” explained Martyn (right), who is pictured with Claas green harvest product manager Dean Cottey. 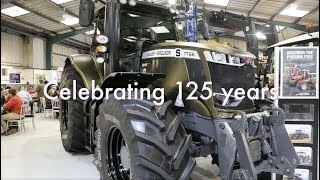 “I have been selling the machines for 25 years and the progress I have seen in terms of development of the Claas foragers has been unbelievable in terms of build quality and performance. We enjoy strong customer loyalty and we try hard to maintain that by providing the very best back-up we can and we enjoy superb back-up from Claas too. The brand isn’t cheap, but the package offered is second-to-none and with its excellent reliability and very high resale values the range makes sense for professional users. “Approximately 80 per cent of the forage harvesters we supply are for grass harvesting with some used for wholecrop. Customers are mainly contractors as well as larger farms with users relying on the after sales service. We keep a huge stock of parts and can rely on Claas to supply anything we don’t have quickly. We run at least two of our own demonstration machines during the season and enjoy what we do. Like Claas, we are a private family-owned business and if we don’t sell we don’t make a living. We have to be good at our job,” he added. Rickerby Hexham, Northumberland branch sales representative Paul Scandle is pictured (left) with Bailey Trailers sales manager Stephen Bailey. “The variety of Rickerby’s customers means there is demand for trailers across our range, although in the west most sales are our silage trailers whereas in the east, most demand is for grain trailers,” said Stephen. “The dealer has always done a very good job for us in the area it serves and has represented our brand for at least 21 years. Our trailers complement the other quality brands represented and, in particular, the Claas products. The representatives are all hard working and diligent and we see regularly what a good job they do for their customers and receive good feedback. The open days are always very good events, resulting in orders placed for our trailers, and we have a promotion running through which anyone buying a trailer will receive a free Bailey’s jacket which is something which has been popular in previous years,” he added. Most of the machinery is displayed under cover, but an outdoor materials handling demonstration included the McConnel Robocut remote control mower, fitted with a digging bucket as well as a larger Kramer articulated telescopic handler and an Abbey Feeder. Pictured with Rickerby sales representative Stephen Ostle (left), are customers Andy and Graham Rae of G Rae Contracting based at Kirkpatrick Fleming near Lockerbie. The business provides a contracting service to farmers within a 30-mile radius of its base, most of its work for dairy and beef farms in the area but also including field work for arable farmers. The business operates two Lexion combines, a 530 and a 630, both with 4wd and three Jaguar forage harvesters, all large 950 models, used to harvest maize and grass. The work also includes wholecrop harvesting for which two Disco headers are used. The tractor fleet includes some Claas models, including three 630 Arions and there are also five front and rear mowers, three 4-rotor rakes and two Volto tedders within the fleet. Pictured (l-r) Lemken area sales manager Kevin Rennie, Nick Graham, David Dickinson and Stuart Dickinson. At the open day were customers of the Carnforth branch; members of the AJ Long Contractors team. The company is based near Skipton, North Yorkshire, and its activities include arable and grassland tasks including silaging, muckspreading, re-seeding as well as umbilical slurry application. Forage harvester operator Sam Horsfall explained that the company operates three Claas Jaguar forage harvesters; a 950, a 960 and a 970 as well as mowers, rakes and tedders and provides a maize and wholecrop planting and harvesting service. two Liebherr 538 wheeled loaders are used for muck handling and buck raking, both supplied by Rickerby and there is one Claas tractor on the fleet. “The Claas products are ideal for what we are doing,” said Sam. Pictured (l-r) are Greg White, Sam Horsfall, Josh Pearson, Andrew Graham and Josh Long. On the Bunning stand were Sam and John Clarke who purchased a new Bunning Lowlander 85 spreader at the Rickerby Spring Show last year. Trading as JE Clarke, the family farm is at Melling, Lancs and has a beef herd and a small amount of arable cropping. “We knew Bunning spreaders were good as we used to have the muck applied by a contractor who used one,” explained John. “It makes a very good job and we are very happy with it. Because we are applying to grass we need a really fine chop and even spread and the Bunning gives us that. We deal with Rickerby for other products, and recently purchased an Opico grass harrow and we often buy sundries there. We are looked after well, the staff are always obliging and we never feel they are taking advantage so can trust them to look after us,” he said. Pictured (l-r) Caroline Bunning, Sam Clarke, his father John Clarke and Bunning sales manager Chris Druce. With Barbara is Andrew Stott who is a full-time stockman with a pedigree Charolaise herd, near Carlisle, and he also has his own herd of pedigree Blondes, which he shows. Tanco’s Variwrap L300 was attracting a lot of interest at the event. “The advantage of its design is that, although it is rear linkage mounted, the bale is loaded without the driver needing to reverse as the side arm gathers the bale in from the side,” explained Tanco sales manager for the UK Michael Dollard. “It is available with two or three plastic dispensers which means it can achieve six layers of plastic in just eight rotations and one button controls the loading and wrapping making operation very straightforward.” The wrapper is priced at approximately #22,000 and a trailed version is available. A new loader-mounted model will be available shortly. Kramp was displaying a range of tools and accessories including its cost-effective Gopart brand. “We deal with all Rickerby’s branches and there is demand for products from across our range, especially replacement hay turner tines due to the grass harvesting season being just a few months away,” explained account manager for the north and borders Steve Falcus. “There has been considerable interest in the forestry equipment promotion we have had available and in replacement radios for tractors too. It is a pleasure to be here supporting the dealer team and we are receiving positive customer feedback.” Steve is pictured with Kramp customer specialist Emma Bailey. As well as a wide selection of its products, there was also a Sustainable Soil Management display on the Opico stand. Regional soil agronomist Kevin Ashford (right) was available to explain the principles of good soil husbandry to visitors. “The principles are the same for both grass and arable crops,” he explained, “as soil biology needs the right environment for crops to thrive. We need to understand the parameters of the soil we have on the farm including how easy it is to repair after damage is done, and what its limitations are. By studying the structure and profile we can make a decision as to whether it is mechanically repairable or not, and we can also carry out chemical soil tests to establish the nutrient contents so that we can work out whether the ratios of the constituents are suitable to allow biological actions to take place. When we understand what we have then we can establish a programme for repair or improvement, and our company can test samples remotely, or travel to the farm for on-site testing, to suit the customer’s needs. “With increasing numbers of biological chemicals coming through we need to ensure the environment we have will allow them to work effectively for them to be a success and understanding our soils is key. A machine such as the HeVa Sward-Lifter, for repairing grassland soils is well-designed and will help improve air content. It is a useful tool to repair or improve the physical environment,” he added. Opico northern area technical support specialist David Mein agreed, pointing out that the Sward Lifter has been very popular with Rickerby’s customers, especially in the western areas for use in a variety of grassland areas. Members of the Rickerby team are pictured with Claas product specialists who were on-hand to help deal with the large number of enquiries from prospective and existing customers. Pictured (l-r), Alan Brown, Martyn Henderson, Jeremy Wiggins, Alastair McCallum, Ken Conley, Phil Myerscough, Alistair McRobert, Nick Taylor and Grant Burnett.